Ladies, you know we all do it. Some of us do it over manis and pedis, while some of us prefer to do it over martinis. Sometimes, we do it after going to the movies or before a big night out on the town. But whenever, wherever, however and with whomever doesn’t really matter, as long as it gets done. We need, crave, yearn for and delight in it, "it" being those precious moments with our girlfriends to divulge in some good ole, down-to-earth, much-needed GIRL TALK. For my closest friends and me, one of the most conducive places to partake in a little bit of girl talk is at Chado Tea Room. There’s something delightfully dainty and wondrous about this little place. It may be how the sunlight streams in from the sunroof and playfully bounces off the pale lavender walls, creating a soft glow throughout the tearoom. Or, it might have something to do with how all of the elements – from the delicate lace curtains to the quaintly peculiar knick-knacks scattered throughout the space – harmoniously blend together to create a soothing and relaxing environment. It’s no wonder that we spend hours upon hours here, sharing our most intimate thoughts while slowly sipping teas and savoring salads, sandwiches and scones. To our benefit, the Chado staff is sympathetically accommodating, never rushing us to leave after a set amount of time. I’m also grateful for how helpful the staff is when it comes to selecting a pot of tea. With more than 300 teas, ranging from herbals to greens – teas hailing from exotically wild destinations to local treats – it’s rather easy to become overwhelmed by the vast selection on the menu. But the waiters and waitresses will enthusiastically steer you towards the tea that would best suit your mood and palate. Just let them know what you’re looking for in terms of taste and body, and ten times out of ten, they’ll know exactly which tea is meant for you. It’s so important to take time out of our hectic schedules to retreat into a safe haven with our friends to unwind. Chado Tea Room provides a refined yet invitingly warm sanctuary of delightful teas and charming decorations to do just that. So next time you’re yearning to gather the girls for a treasured heart-to-heart, you know where to turn! PICTURED BELOW: I’ve come to learn that the art of tea involves sharing. I recommend getting a few pots of tea for the table. A hot black tea, a hot green tea and an ice cold refreshing tea will allow your group to sample a nice variety. Desserts are a must. PICTURED BELOW: The immaculate and precise attention down to even the most minute of details can be seen in everything from the individualized teapots to the presentation of the meals. PICTURED BELOW: The same exceptional teas you taste in Chado’s tearoom can also be purchased for an exceptional teatime in the comforts of your own home. You know how the saying goes: “Never judge a book by its cover.” Had I not taken this advice to heart, I never would have patronized CiCi’s Café. There’s nothing aesthetically resonating about it, so I would have categorized it as blasé and gone on my merry way. Tucked away in a homely Tarzana strip mall, it neighbors a bustling barbershop and a greasy BBQ joint, and it's surrounded by a cramped parking lot. Inside, the décor is simple and clean, with no memorable accents or features. No, I haven’t tried every item on the menu, but I can confidently say that everything I have eaten thus far has been superb. The Red Velvet Pancakes, hands down, are my favorite. Already oozing with great red velvet goodness, they’re stacked with rich chocolate mascarpone cream, silky chocolate sauce and a dollop of whipped cream. When I’m in the mood for something savory, I order the Veggie Burger. It’s a monstrosity of veggies, cheese, avocado and patty on a whole-wheat bun. Recently, per the owner’s suggestion, I tried the Kahlua Pancakes, which were light, fluffy and refreshing. Cruising down Ventura Blvd., it’s quite easy to not even throw so much as a second glance in the direction of CiCi’s Café. But don’t let the tiny appearance fool you – this place is remarkable. It’s one of the best hidden brunch secrets in the Valley. Spread the word about it, and see you there! PICTURED BELOW: The Kahlua pancakes. The owner told me that they are the most popular pancake dish amongst customers. PICTURED BELOW: The Mama Bea Omelet. My friend Kaneema’s all-time favorite dish. Veggie sausage, spinach, mushrooms, garlic and mozzarella affectionately enveloped by egg whites and drenched in tomatillo sauce. PICTURED BELOW: The atmosphere is casually relaxing. Feel free to come in comfy sweats with an expandable waist. These two worlds effortlessly collide together at El Compadre, a charming Mexican restaurant that’s architecturally designed like an outdoor villa on a warm summer’s night. There are ruby red, worn leather booths underneath wooden “porches,” a Mariachi band that plays passionately and a bustling bar area with a handful of eccentric characters. But most importantly, there’s El Compadre’s signature drink, the Flaming Margarita. This fiery concoction is as pleasing to the eye as it is to the palate. It’s cute, it’s charming and it’s strong – all the characteristics I appreciate in my cocktails (and in my men). My eyes dance with delight every time I order one, enchanted by the miniature blue flame that floats atop the ice. I’m not the only person who appreciates the Flaming Margarita. In fact, El Compadre is always bustling, and I’m certain it has a little something to do with this infamous cocktail. Bright-eyed actors fresh off the plane from the Midwest, big-time movie execs, pot-bellied truck drivers, Yuppies, tourists – anyone and everyone over 21 years old manages make their way to the bar and return with one – if not two – of these margaritas. 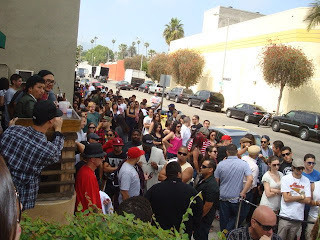 El Compadre has the insider’s perspective of Hollywood when the cameras stop rolling. So pull up a stool next to that man who looks like he’s been perched there since 1975, order a Flaming Margarita and enjoy! PICTURED BELOW: The infamous Flaming Margarita. You may not walk too straight after one of these. PICTURED BELOW: Just the way Mexican food should be: comforting and filling. PICTURED BELOW: The Mariachi band provides soothing background music. Where to Be Merry: The Do Over - It's Baack! Swaying palm trees. Sun-kissed shoulders. Sultry sunsets. Seductive grinding. 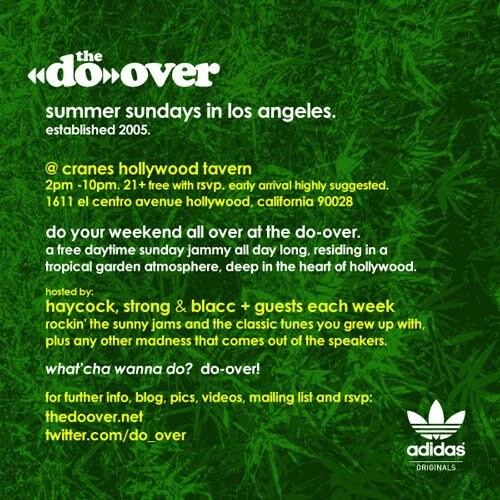 Deliriously intoxicating sangria... At the Do Over series, L.A.’s children of the rainbow congregate with the sole purpose to vibe on Sunday afternoons. It’s the celebration of summer’s effervescent return, where each week, an eclectic group of frat boys, homeboys, hipsters, free-spirited artists and the occasional celebrity peacefully unite at the modest Crane’s Tavern. It’s an urban utopia that successfully brings all walks of life together, all in the name of having a good time. 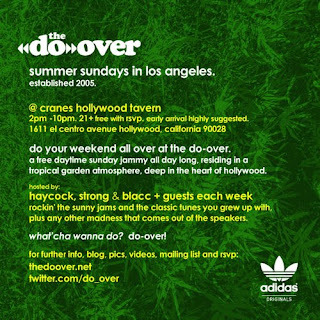 Music takes forefront at the Do Over, as a steady stream of respectable DJs flex their skills on the turntables. From local talent to international names, these masterminds pour out a continuous mix of hip-hop, samba, salsa, disco and R&B, with an occasional nod to rock, techno and other genres. The way that the DJs work their sets, it’s as if they’re competing with one another to see who can get the crowd the most hype. Roars of delight, fists in the air and bodies jamming in motion acknowledge when the right song comes on. I personally look forward to the Do Over for one simple reason: it’s a hassle-free hangout destination. For starters, there’s fairly minimal drama to enter. No cover charges – no ego-trippin’ bouncers (Note: the key is to come early or come late. Never arrive between 4pm-6pm, unless you like standing in super long lines). Plus walking into the packed patio is like walking into a good friend’s backyard cookout: amicable strangers greet you with cups of sangria and finger-lickin’ BBQ is available for reasonable prices. I’ve marveled at how the Do Over has managed to enchant me for four consecutive years. Each winter, my spirit reluctantly retreats into hibernation, experiencing Do Over withdraws and anxiously awaiting for next year’s spring. I’m thrilled to spend my Sunday afternoons sipping sangria and watching the sun sink into oblivion at this spectacular series. Hope to see you there, too! PICTURED BELOW: Crane’s Tavern tends to fill quickly, so dress accordingly. Think loose clothes, and definitely no white articles of clothing. Sangria stains are hard to wash out - I speak from personal experience. PICTURED BELOW: Grab a pitcher of sangria. Expect to share, but also expect to receive. PICTURED BELOW: All the info you need about this weekly summer series. I distinctly remember savoring the best sushi in my life. My friend Jade and I were at a posh Beverly Hills restaurant for a magazine launch party, and platters of premium sushi rolls made their way around the outdoor patio. I gingerly plucked a spicy tuna roll into my mouth and almost passed out; the fish was so buttery, so rich, so divine. It literally melted in my mouth. I wistfully departed that party, knowing that I wouldn’t be returning until I could drop $400 on dinner on any given night. My heart broke at the thought of never tasting sushi that intoxicating again. Fortunately, my heart didn’t stay broken too long. A few weeks later, Jade invited me to test out the happy hour at Fat Fish on Robertson Blvd. in West Hollywood. We sauntered into the back bar area, a nonchalantly cheery space accented by sleek modern lighting fixtures, abstract artwork and a plush couch set. A crowd of fashion-forward yuppies checked us out and greeted us with slight nods of acknowledgment. We perched ourselves on stools by the bar. Since everything was incredibly well priced – think $6 cocktails and ½ off $12 sushi rolls – we splurged. We stacked up on appetizers, specialty rolls and soku-infused margaritas. For the hell of it, I ordered a spicy tuna roll, although I honestly wasn’t expecting much. Well imagine the surprise that surged throughout me when that buttery piece of fish melted in my mouth, tasting so similar to the expensive fish I had cherished only days ago. Fat Fish’s spicy tuna was unquestionably comparable to the $50 roll. Only difference was, it was a tenth of the price. For such a trendy restaurant on one of the trendiest streets in one of the trendiest neighborhoods of Los Angeles, what baffled me was how such a quality grade of fish was so inexpensive. But I didn’t dwell on it too long. Instead, I just regularly meet Jade there and order my beloved spicy tuna roll. Perhaps I’ll see you ordering one next time as well! Pictured below: The infamous spicy tuna roll. A happy hour must! Pictured below: The modestly calm yet vibrant back bar area, where happy hour takes place. Call in advance to reserve the couch area.